I am so excited to share some stuff from one of my favorite coaches, Greg Kampe of Oakland (Michigan) University. I saw Coach Kampe speak at a nike clinic a number of years ago and he was one of the best and most informative coaches that I have seen. He gave everyone real things that they could use and not just stories. Coach Kampe also told coaches that if they contacted his office, they would get information on the Oakland University Golden Grizzly Dribble Drive Offense. I followed up with this and received a note, this packet, as well as several dvds of practice and installation of this offense FOR FREE! Coach Kampe must be doing something right as he is entering his 32nd season at Oakland, helping them to transition from DII to DI and more recently from the Summit League to the Horizon League. Through 31 seasons, Coach Kampe current record is 535-403 (.570) overall. In 16 seasons at the division I level, Coach Kampe is 271-241 (.529). He currently ranks third behind Mike Krzyzewski of Duke and Jim Boeheim of Syracuse for most consecutive seasons with the same program. Coach Kampe also ranked 19th as of 3/16/15 on the most wins by active DI coaches list. As of 3/24/15, Coach Kampe ranked 4th on the list active coaches with the most wins at the same program only trailing Rick Byrd of Belmont, Boeheim. and Krzyzewski. Kampe began his career with more traditional offense and hated the idea of “playground” basketball as he called offense’s like the dribble drive. He later came around to this style of play and began using a structured Oakland University Golden Grizzly Dribble Drive Offense that allows players to play but also can give more control to the coaching staff. Using this Oakland University Golden Grizzly Dribble Drive Offense system, Coach Kampe’s teams began playing with great success. 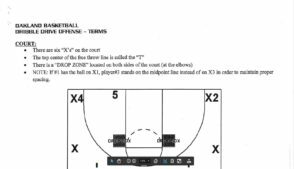 Kampe’s offense uses several key terms to communicate actions on the court. “PITCH” – A pass by a player who tried to drive the ball but was stopped (at the top center free throw line) so he “pitches” the ball to the cutter behind him. All pitches should be positive (downhill). 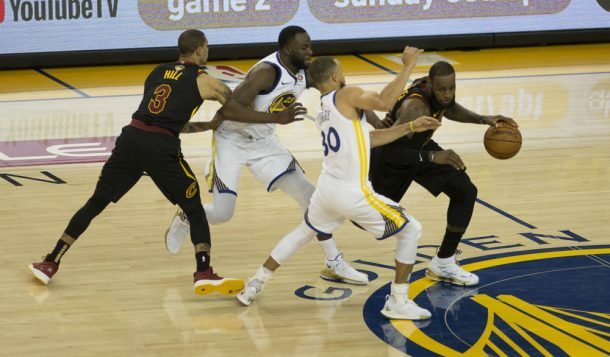 “LOOP” – A dribble drive by a player where he cannot get by his defender so he stride stops (jump stop with chest to the sideline) in the drop zone and throws the ball to the “x” where it is met by a cutter. The cutter (X2 or X4) does not leave until the driver picks up his dribble. “KICK” – A drive and “kickback” pass to the man that the player originally received the ball from. This is a good opportunity for feeding the post. “FIST” – A call that signals #5 to sprint and set a ball-screen. Often successful after a loop or pitch. “THROUGH” – A cut through the “T” which opens a driving lane behind him (ie. #3 cuts through the “T” and #1 drives behind him). Also called a draft drive in Read and React lingo. “QUICK” – A quick entry pass to a player for a one on one opportunity. The passer cuts to the opposite corner. I hope that these are helpful to you and your teams. Good luck this season and remember to enjoy the journey! Follow Coach Erick Blasing on Twitter!! !